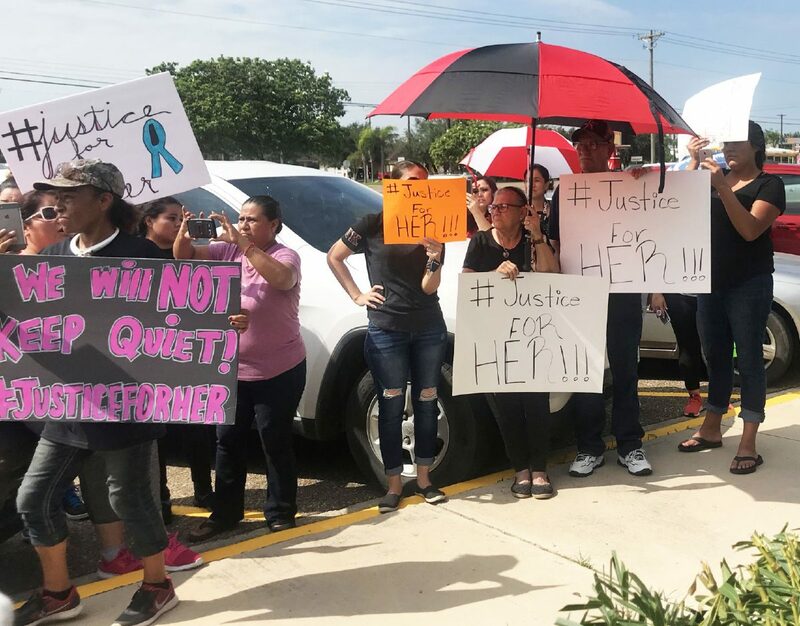 A group of mostly parents of La Joya school district students gathered outside district offices Monday to protest what they said was lack of information and justice after an alleged sexual assault of a former Tabasco Elementary student earlier this year. LA JOYA — La Joya school district officials held a news conference Monday morning to clarify what they said was misinformation being spread on social media amid protests by parents demanding information on allegations of a sexual assault at Tabasco Elementary last school year. Due to the nature of the allegations and because the students involved are minors, The Monitor will not publish the names circulating on social media. School district officials also stated they cannot go into details of the events or the investigation without breaking state and federal confidentiality regulations. Claims on social media allege that a 14-year-old male student attacked a 5-year-old female student at Tabasco Elementary in the bathroom during school hours last school year. 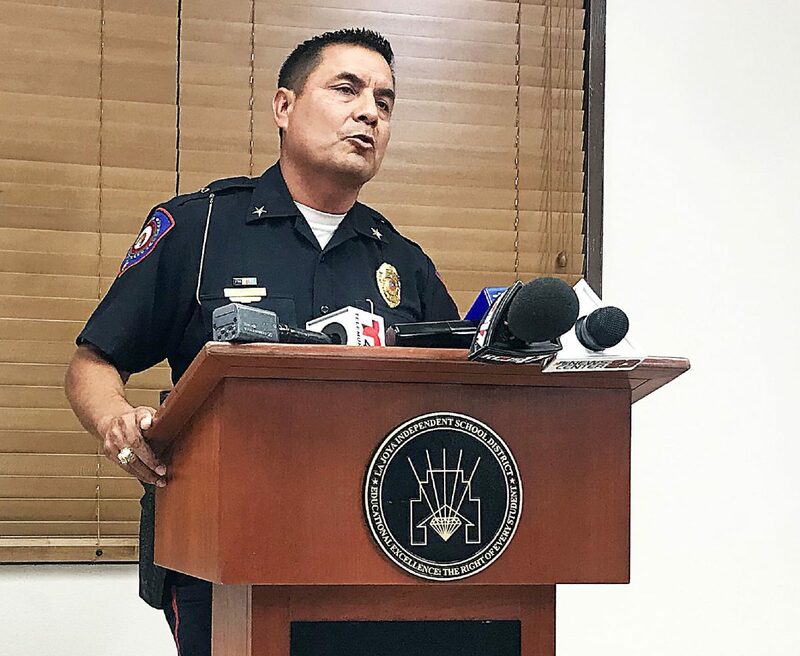 La Joya school district police Chief Raul Gonzalez addresses media at a conference intended to clarify what he said was misinformation circulating on social media about an alleged sexual assault at Tabasco Elementary last school year. Furor over the alleged attack surfaced after parents claimed justice was not served to the female victim because the teen only received one year of probation for the alleged attack. District officials did not comment on the validity of the allegations but said that the matter was brought to the attention of police and district staff April 26. The district police department investigated the case and an arrest was made. The case was then reported by the district to Texas Child Protective Services and the Texas Education Agency, and transferred to the Hidalgo County District Attorney’s Office. Officials confirmed the teen was a tutor as part of the Coca-Cola Valued Youth Program, a program where at-risk middle and high schoolers are given the opportunity to tutor younger peers. The program is run by the Intercultural Development Research Association and adopted in school districts nationwide and even internationally. At La Joya school district this program has been in place for 20 years districtwide, officials said, but after the alleged attack was reported at Tabasco Elementary the program was discontinued immediately and indefinitely last spring, but only at that particular campus. After the public outcry and questions surrounding the Valued Youth Program, the district decided to suspend the program district wide, officials said in a news release sent hours after the press conference. The school district provided a counseling opportunity to the alleged victim, but the family denied the services and the student was removed from the school district, Gonzalez said, adding that the community has been spreading false information on social media after the legal course took place. Most parents on social media, and those present outside the offices of the La Joya school district where the news conference took place, demanded answers and information be provided to them. Parents staged a protest outside Tabasco Elementary Monday morning, but said the school principal, Marena Contreras, did not address them and were told instead to attend the news conference at the public information offices. The parents migrated to the offices but only media was allowed to enter the building. Gonzalez said there are guidelines they must follow to protect the students. Also addressing the news media at the conference on Monday morning was school district attorney Jerry Muñoz, who echoed the confidentiality regulations and emphasized that the district has no control over the judicial process and its evidence-based outcome. Investigations are conducted without giving any student favorable treatment over another, he said, and politics are kept out of the matter.